The human body is not just a passive device carrying out messages sent by the brain, but rather an integral part of how we think and make decisions. In her groundbreaking new book, Sian Beilock, author of the highly acclaimed Choke, which Time magazine praised for its “smart tips...in order to think clearly...and be cool under pressure,” draws on her own cutting-edge research to turn the conventional understanding of the mind upside down in ways that will revolutionize how we live our lives. 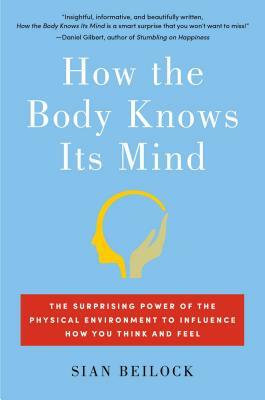 At the heart of How the Body Knows Its Mind is the tantalizing idea that our bodies “hack” our brains. The way we move affects our thoughts, our decisions, and even our preferences for particular products. Called “embodied cognition,” this new science—of which Beilock is a foremost researcher—illuminates the power of the body and its physical surroundings to shape how we think, feel, and behave. Beilock’s findings are as varied as they are surprising. For example, pacing around the room can enhance creativity; gesturing during a speech can help ensure that you don’t draw a blank; kids learn better when their bodies are part of the learning process; walking in nature boosts concentration skills; Botox users experience less depression; and much more. From the tricks used by advertisers to the ways body language can improve your memory, Beilock explains a wealth of fascinating interconnections between mind and body and how mastering them can make us happier, safer, and more successful. "How often do you read a book that is profound and also fun -- or that is full of surprises, but that also gives you that pleasant jolt of immediate recognition? Do a big favor for your body and your mind. Read Beilock's terrific book as soon as you can!" "Insightful, informative, and beautifully written, How the Body Knows Its Mind is a smart surprise that you won't want to miss!" "How our bodies and minds work in tandem. Wide-ranging, informative and entertaining, especially for parents and educators." "Sian Beilock shares the insights of embodied cognition with the rest of us.Through vivid stories and clear explanations, Beilock reveals how our bodies shape our thoughts and actions in surprising and compelling ways. It's rare to find a first-class scientist who is also a first-class writer; Beilock, lucky for us, is both."